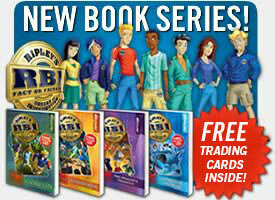 On July 28th Ripley's RBI01: Scaly Tale hit the number 4 spot in the Juvenile section of the Google e-book store. I contacted Amy Webb, the Production Coordinator at Ripley Publishing, to get their thoughts on their e-format success. First, tell us what Scaly Tale is about. Tell us about Ripley's path to publication: Independent or traditional? Recently or further in the past? Ripley’s has been publishing its Annual book since 2004 and publishes more than 1 million copies annually worldwide. Titles in this series include "Download The Weird", “Strikingly True”, and “Enter If You Dare”. This book is best known for it's incredible covers which always includes an eye-catching lenticular, as well as outstanding designed pages throughout. In 2011, we were featured in Moon Beam Children's Book Awards, USA Books awards and The Wall Street Journal Best Sellers List. 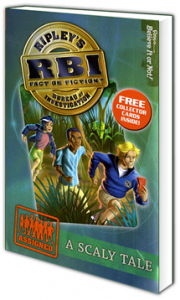 We have heard from many librarians and educators that Ripley’s should publish a fiction series for younger children especially aimed to boys and reluctant readers.From this suggestion we are happy to present the RBI Series. The series is launching with four titles: “A Scaly Tale”, “The Dragon's Triangle”, “Running Wild”, and “Secrets of The Deep”. The stories are adventure based with a diverse group of kids from around the world. They travel on investigations to decipher "fact from fiction". This specific title is FREE! We are hoping that by giving this title away for free, it will peak the interest of the reader and they will want to continue on the adventure and read all others in the series. We currently visit many book shows, we blog, we conduct giveaways, and we have put great effort into the launch of this new series. Please review our dedicated website for this series at www.ripleysrbi.com. As the series grows, this site will be continually updated and the level of interaction increased. Our target audience is ages 7-11, boys and reluctant readers. Ripley Publishing has always been very excited about e-publishing. We embrace change & technology! We believe it opens a brand new avenue for book publishing. Is your book available in print format? Which came first and why? Yes, this title was first published in print format. At the time it was published, we were not ready for ebooks. Today, in 2012 we have grown and now have all our titles in ebook form. Check out the Author Index tab to read about other Youth and YA Top Ten e-books and their authors. And stop by every Saturday to see the updated Kids' EBook Bestseller List.